The con goes something like this: You get a call from Jamaica saying you’ve won millions in the lottery. But to collect the cash, you’ll first have to wire hundreds or even thousands of dollars to cover taxes and fees. Once you begin to pay, the calls multiply. Larry Caruso is head of security for FairPoint Communications. "It’s gone on from Maine to Alaska,", said Larry Caruso, head of security for FairPoint Communications. 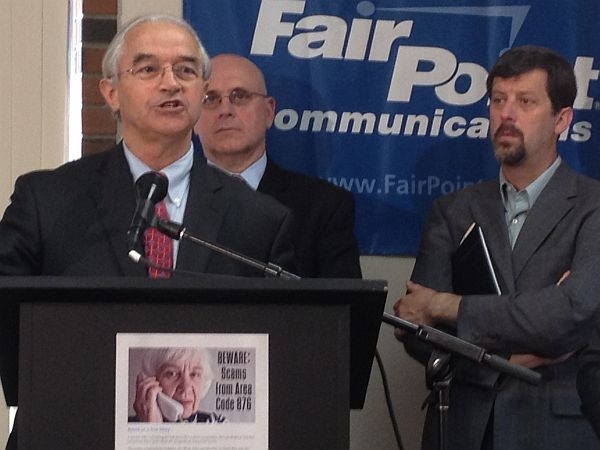 "But right now in the FairPoint footprint, Maine, New Hampshire and Vermont are being victimized at just an alarming rate. We have victims who have lost to the Jamaicans specifically half a million dollars or more," Caruso said. Attorney General William Sorrell says about 30,000 suspicious phone calls are made to the United States from Jamaica’s 876 area code every day. This year alone, he said, the scams will cost Americans an estimated 300 million dollars. At a Rutland news conference, Sorrell spoke of an elderly Rutland man who lost $500,000 to various scams, including the Jamaican lottery. Sorrell said his office has gotten about a thousand calls over the past two years concerning phone scams. And many cases go unreported. The elderly are often targeted because, he said, they tend to be more trusting and are more likely to answer the phone. "Many of them are socially isolated, so they like having the ability to talk to someone on the phone, especially someone who is so nice and friendly and helpful," Sorrell said. "And some of these scammers will just say, ‘I want to pray with you right now.’ And they’ll build up this empathy and they become friends and they look forward to the calls because they’re otherwise bored." What makes it so frustrating, he says, is that these types of crimes are very difficult to prosecute and any money wired out of the country is almost never found. Which is why Fairpoint Communications has launched a new public relations campaign with an online video and website to warn the public. Jean Britt is a retired nurse who lives in Castleton, and she said she, too, wants to help. A widow, she said she was recently duped in a phone scam that cost her dearly. And she hopes that by talking about it, others may learn from her mistake. "I was so ashamed of myself that I fell into this – that I did," she said. "And yet it was so real. It was SO real, it was unbelievable." Britt shook her head. "I was a college professor. I should have known better," she said sadly. Hopefully, other seniors out there, won’t be taken in," she said.